Gallup has created a wonderful personality tool called, Clifton StrengthsFinder. It has been proven to help people achieve greater success at work and in relationships. Can it also do the same for personal evangelism? I’m doing research through Bethel Seminary (St. Paul, MN. ), to discover if StrengthsFinder can also empower Christians who feel inadequate for personal evangelism. As part of my Doctor of Ministry research, I surveyed Christians who have taken Clifton StrengthsFinder and who come from a variety of Christian backgrounds. I want to thank everyone who took the survey! Your participation in this survey provided information to support others to be more faithful to God’s call to share our faith. Soon, I will start a series of posts on how Clifton StrengthsFinder can empower Christians in personal evangelism. Thank you for assisting in this research! The other week I was asked to be a guest blogger for my friend Lisa Colon Delay, who I went to Kutztown University with. I thought I would repost what I wrote for her blog on my blog. Would love to hear your thoughts on it. For the last two and half years I’ve been planting Veritas, a missional community in Lancaster, PA. There are various challenges in this. There’s the challenge of developing a Core Group for Veritas. There’s the struggle of seeking to do church in a whole new way in an area that has a fairly traditional view of what church is. There’s the challenge of balancing 4 part time jobs between my wife and me, a free lance job, two kids and keeping up with everything that comes with running a household. But the biggest challenge that I have been faced with revolves around the issue of identity. All too often, whether in planting a new faith community, or just in life, we define ourselves by what we do. And we define our self worth from what we do, and whether we are “successful” or not. Maybe men do this more. Scripture says this about me, “he predestined us for adoption to sonship through Jesus Christ, in accordance with his pleasure and will” (Ephesians 1:5), and “The Spirit you received does not make you slaves, so that you live in fear again; rather, the Spirit you received brought about your adoption to sonship. And by him we cry, “Abba, Father.”(Romans 8:15). Too often I say to myself (or Satan says) the very opposite of these words. I forget that I am a child of the King and that I am loved, not for anything that I can do, have done, or will do. I am loved period. One thing that stuck from my years at seminary that has helped me confront this problem of identity is this simple statement, “There is nothing you can do to make God love you any less. There is nothing you can do to make God love you any more.” My identity is not in being a church planter, a father, a husband, or anything else that I try to define my worth in. My struggle is to remember that, and place my identity in the fact that I am a child of the Heavenly Father. The Church of the Brethren and Urban Express North American are co-sponsoring a webcast with Stuart Murray and Juliet Kilpin in collaboration with Pacific Conference Brethren in Christ, Pacific Southwest District Church of the Brethren and Pacific Southwest Mennonite Conference USA. It will be held March 10, 2012, from 10 am to 4 pm PST. Stuart Murray Williams and Juliet Kilpin will be presenting on what does it mean to follow Jesus in a changing culture, in which the Christian story is no longer familiar and the church is on the margins? Post-Christendom is well advanced in most western societies and this is the emerging reality in the US too. How do we respond to the challenges and seize the opportunities? What role does church planting play as we search for relevant ways of being church in this emerging culture? And what can the Anabaptist tradition offer –- a tradition with centuries of experience on the margins in which many are finding inspiration and fresh perspectives? Stuart Murray has spoken at previous Church of the Brethren events and has written The Naked Anabaptist and Post-Christendom. The cost is $35 for the webcast and this includes CEU credit. For more information or registration go to this link. A few weeks ago I got an e-mail from Mike Morrell, who runs the Speak Easy blog program that I am a part of. This e-mail was letting me know that Speak Easy had a book that I could review. The book? Sacrilege: Finding Life in the Unorthodox Ways of Jesus by Hugh Halter. As soon as I read the e-mail I went right to the form and filled it out hoping that I wasn’t too late. I hit submit, held my breath, and waited for the confirmation that I indeed got a copy to review for Speak Easy. Seconds later I received that confirmation that i was hoping for, a chance to read the newest book by Hugh. You see Hugh and his normal writing and ministry partner Matt Smay have influenced me in profound ways in their books The Tangible Kingdom and AND:The Gathered and Scattered Church. And Veritas has used their Tangible Kingdom Primer in developing missional communities (and plan to do so again in the coming year). So I was excited to see what Hugh had to say about following Jesus. And of course the title Sacrilege, which normally is seen as a bad thing in Christian circles, grabbed my attention right away. I appreciated the book and what Halter was seeking to do, unpacking Jesus from the religious confines that He has been wrapped up in for 2,000 years and to truly see Jesus as “the ultimate sacrilegious leader.” I resonated with his use of the beatitudes to show the sacrilegious nature of Jesus and how if we follow Jesus, by living out the beatitudes, we’ll be committing sacrilege as well and becoming sacrilegious apprentices. I’m thankful for Mike Morrell and Speak Easy for the opportunity to read and review Sacrilege. Hopefully reading this book can help and remind me to flip some tables and follow the subversive, countercultural, and sacrilegious leader Jesus of Nazareth. Vision: To see that we at Veritas serve and bless people in real and practical ways. 3. Train, meet, resource, and network with the Missional Communities OUT Leaders. 4. Develop ways, ideas, and dreams of getting OUT into the world and blessing it and means of getting the word out about Veritas. 5. Meet monthly with Pastor/Church Planter and Elder team. Vision: To create regular opportunities of relevant worship experiences, not as consumers but participating in and creating the worship that is taking place, with people connecting worship on Sunday with their worship on Monday through Saturday. 1. Partner with Pastor Ryan on planning the Corporate UP Gatherings (2x a month), the sermon series planning, and what each Missional Community is “studying” during their UP Gatherings. 2. Train, meet, resource, and network with the Missional Communities UP leaders. 3. Develop in Partnership with Pastor Ryan a discipleship process for Veritas. Vision: To help Veritas become a community full of love, grace, compassion, and mercy, following in Jesus’ footsteps. 1. Partner with Pastor Ryan on planning IN events, activities and gatherings that strength the relational community. 2. Train, meet, resource and network with the Missional Communities IN Leaders. 3. Create, Oversee and work on a Hospitality Team for our Corporate UP Gatherings. 5. Meet monthly with the Pastor/Church Planter and Elder team. Vision: To see that Veritas honors and glories God in the areas of stewardship and strategic development. 1. Partner with Pastor Ryan on funding initiatives. 3. Serve as Treasurer to collect and deposit offering (work with supportive church book keeper). Eventually the Collaboration Elder will oversee an “in-house” financial team responsible for keeping the books, and all financial matters. Helps develop the budget in partnership and in conversation with the elder team (including the Pastor/Church Planter. Elders meet at least monthly. The monthly meeting will include prayer, sharing from each Elder about what is going on in their area of responsibility (UP efforts, IN efforts, OUT efforts, and Administrative details- financial report, etc…), vision plans, dreaming together, and strategic planning for the future. 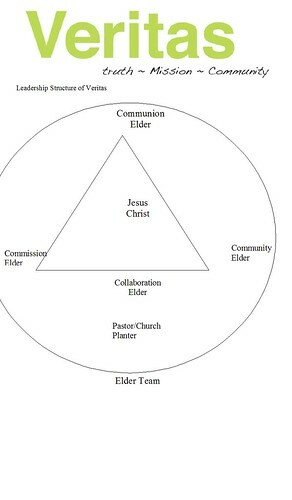 Elders are responsible for the day to day, month to month work of the church. The Church Planter/Pastor is part of the Elder Team, has a vote within the Elder Team and is ultimately accountable to the Elder Team. The Elder Team is also responsible for the yearly church budget.